Requiring only three ingredients and a mere 15 minutes to prepare—dashi is a simple cooking stock that can be used to make everything from soups, to sauces and custards. Umami, the 5th basic taste, is achieved by simmering kelp (dried seaweed) and bonito fish flakes in water. You may be surprised to hear that the most important ingredient of the three is the water. But, as I explain in detail in the video below, good food starts with good water. This is especially true when it comes to making dashi, as it is the foundation of so many dishes. Here in Seki, I use fresh mountain spring water to simmer the bonito flakes and kelp, resulting in a delicate savoury broth. Many of the recipes I share on my blog call for either ichi-ban (1st brew) or ni-ban (2nd brew) dashi, and learning how to prepare both will allow you to cook Japanese food more authentically. Today, even in Japan, homemade dashi is less popular, and powdered or liquid instant forms are predominantly used in restaurants and at home. At the Ozeki Cooking School, we prefer the real thing, as it has a more subtle flavour and is free of additives and excess sodium. This week, we will be making ichi-ban dashi, which has the stronger flavour of the two. It is often used to make clear broth, miso soup, tempura dipping sauce, dashi-maki tamago (thick egg omelette), chawan-mushi (steamed egg custard), dashi-based sauces and marinades, and the list goes on. It also freezes well for about a week, so you can make it on the weekend and thaw for use on busy weeknights. Watch me make dashi in the video and follow along! Place the water and kelp into a large pot. Do not wipe off the white powder on the dried kelp as it is umami, the natural savoury flavour. Heat the water and dried kelp on medium heat. After about 10 minutes, just before the boiling point, remove the kelp and set it aside for making ni-ban dashi (2nd dashi stock). Do not boil the water with the kelp, otherwise the water turns green and loses the subtle flavour of the dried kelp. Bring to a boil and remove from heat at once. If froth is produced, skim it off the top (as pictured below). Strain the dashi stock through a clean cheesecloth into a clean pot. 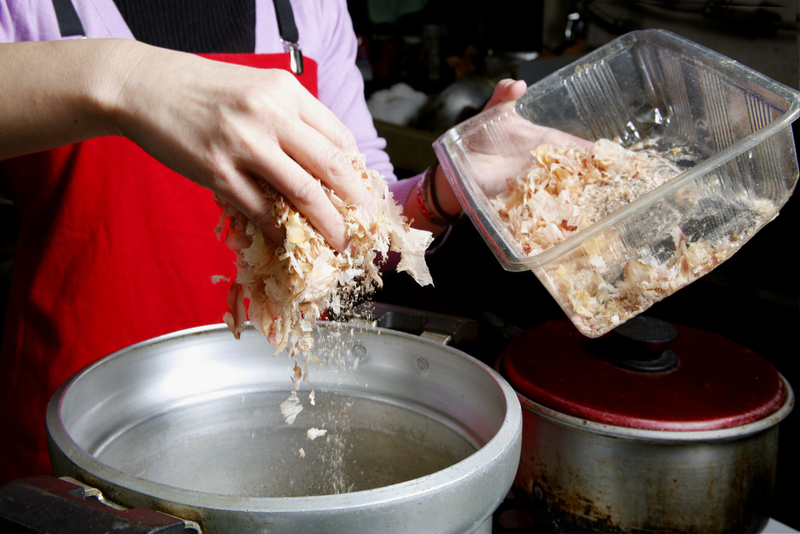 Do not squeeze the fish flakes as you may spoil the purity and clarity of the stock. Next time, I will show you how to make ni-ban dashi by re-using the kelp and bonito flakes from the first brew of the dashi stock. The broth is cloudier and the resulting taste is less fishy, making it an excellent base for miso soup. We use it to cook vegetables, infusing them with the delicate umami flavour.